WARNER LIBRARY and A PALO SECO FLAMENCO COMPANY with Rebeca Tomas, present: “FIESTA FLAMENCA”, Celebrating Hispanic Heritage Month. 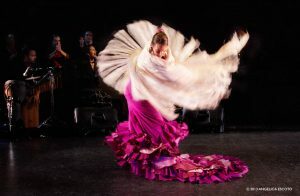 Enjoy interactive Flamenco activities present by A Palo Seco Flamenco Company during the Tarrytown/Sleepy Hollow Farmers Market on Saturday, September 22 at 10am-1pm. Activities include: Costumes, Castanets, Bilingual Storytime / Vestuario, Castan~uelas, Cuentos Bilingues. Free parking located at John Paulding School.